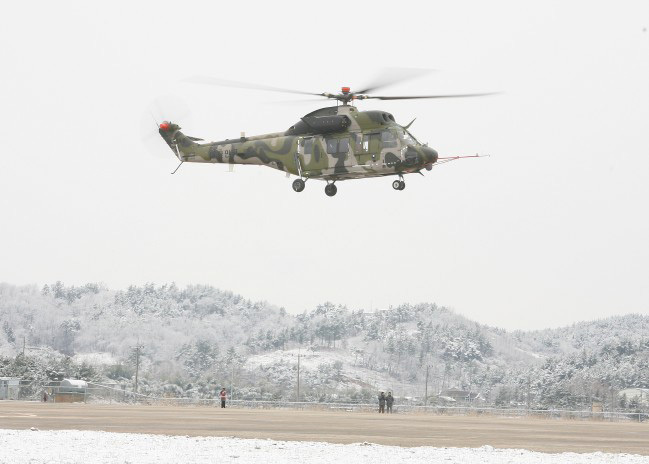 Korea Aerospace Industries (KAI) flew the prototype of its Surion utility helicopter for the first time on March 10. Flown by two pilots and with a test engineer aboard, the Surion took off for a 30-minute maiden flight at Sacheon air base, near Korea’s south coast, and performed hovering and hover turns. The flight envelope will be expanded with transitions in the coming weeks, and by April the aircraft is expected to reach its cruising speed of 140 knots. Initial production is due to begin at the end of the year. The Surion has been developed to answer the Korean Utility Helicopter requirement, and 245 are expected to be built to replace the country’s McDonnell Douglas MD500 and Bell UH-1 helicopters. The Surion design has been undertaken in partnership with Eurocopter, which signed a $1.15 billion research and development contract with KAI in June 2006. The first Surion was rolled out at Sacheon on July 31. Powered by two General Electric T700 turboshaft engines, the Surion is in the 8.7-metric-ton (20,000-pound) helicopter class. In addition to technical assistance, Eurocopter is providing the transmission and rotor mast, and has a 20-percent stake in the production phase. It is believed that some elements of the design are based on those employed in the Eurocopter Super Puma/Cougar.